The CHN blogger enjoyed an informative and interesting visit to a small museum as part of History Week 2018 conducted by the History Council of New South Wales. The museum in question was the Penrith Museum of Printing located in the Penrith Showground. The museum has a collection of fully operational letterpress printing presses and equipment from the 1860s to the 1970s. It is part of the living history movement that is so popular with tourists in North America, Europe and increasingly Australia. The printing equipment includes linotype machines, flat-bed printing presses of various types and platen presses. There is also a substantial collection of hand-set type. During the History Week visit the operation of the different presses was explained by retired tradesmen who had been printers and compositors. They kick started the presses and linotype machines and demonstrated their capabilities. The museum is setup like a 1940s printing shop and the visitor gets the experience of the noise of the press and linotype machines and the smell of the ink. It is the authentic real deal. Linotype machines were introduced to replace hand-compositing of pages for printing. Hand setting was very slow. What would take a compositor hours to set in a page would take minutes with a linotype machine. The printing museum is also a site for the demonstration of the traditional trades of the printer and compositor. The printing museum give a real demonstration of how the local newspapers of the Macarthur region were produced before the current era of off-set printing. The processes for printing the local paper were labour-intensive despite the introduction of these pieces of equipment. This type of equipment had a profound influence on the production of local newspapers across the world. It is interesting how much of the terminology used in computer word processing derives from the smell and noise of the print shop and the lives of the printers and compositors. The Sidmans in the early 20th century introduced the latest equipment at the principal printery located in the building that houses the Camden News office and printery at 145 Argyle Street Camden. The Richardsons had the latest equipment at their headquarters and printery at 315 Queen Street Campbelltown for the Macarthur Advertiser and other newspapers. The story of the Museum begins with Alan Connell, the founder of the museum who had a desire back in 1987 to develop a “working museum” of letterpress printing machinery and equipment. As the story goes, many years had to pass before Alan’s dream was able to be fully realised via a Commonwealth Government Federation Fund Grant. The Penrith Museum of Printing was officially opened on the 2 June, 2001 by Ms Jackie Kelly, M.P. for Lindsay, the then Minister for Sport and Tourism. A large proportion of the machinery and equipment on display originally started its working life in the Nepean Times Newspaper in Penrith, NSW Australia, while many other items have been donated by present and or past printing establishments. To experience the smell and noise of the local newspaper printery a visit is a must to the Penrith Museum of Printing. For contact details go to the website of the Penrith Museum of Printing. Visitors were encouraged to discover Goulburn’s Living History as part of the ‘Our Living History’ festival in Goulburn NSW. Held between 9 March and 12 March 2018 the Celebrate Goulburn Group co-ordinated the event. Organisers were encouraging residents and visitors to celebrate and enjoy the city’s heritage. The event was sponsored by the New South Wales Government through the Heritage Near Me Project. This blogger joined the visitors and was out and about at two participants in the festival and took in a Georgian house museum and garden and an a museum highlighting the steam technology at a local pumping station. Visitors were encouraged to embrace the theme of ‘Unearthing Riversdale’ at the homestead at 2 Twynam Drive Goulburn. Built in the late 1830s as a coaching inn, Riversdale later became home to the district surveyor, Edward Twynam and his family. Edward was appointed Chief Surveyor of NSW during the 1890s and his family occupied Riversdale for almost 100 years prior to its purchase by the National Trust. The building is a Georgian style and now interpreted as a farm homestead. Riversdale was variously known from 1840 as the Victoria Hotel, the Victoria Inn and the Prince Albert Inn. The building was located on the main road of the ‘Goulburn Plains’ and the site had been occupied by Matthew Healy with built a slab hut public house in the 1820s. Healy also built the kitchen and stable. Healy sold out to Anne and John Richards who ran an Inn. The site of the town was moved to its current location and the Inn became unviable and the building became a boarding school and then a small farm. The building was called Riversdale in the 1860s by John Fulljames. The Twynam family took up residence in 1872, and the family occupied the residence until the National Trust purchased the property in 1967. The National Trust rejuvenated the house garden in 1967 in the Gertrude Jekyll style with plantings of herbaceous borders and silver and grey foliage plants. Many 19th century plantings were added and included bearded iris, bulbs, peonies, aquilegia, delphiniums, lilies, lavender and old style roses. Much of the garden was established by the Twynam family in 1872. There are historic trees in the garden with plantings from 1820s and of particular interest is the avenue of English elms at the rear of the courtyard from the 1840s. The elms were planted by the inn owner Anne Richards, who also planted the medlar on the eastern lawn. An interesting piece of steam driven technology is the waterworks pumphouse on the Wollondilly River. The waterworks pumphouse was built between 1883 and 1885 by Harbours and Rivers Board of the NSW Public Works Department on the Wollondilly River at Rocky Point. The supervising engineer and designer of the works for the pumphouse and Marsden Weir was EO Moriarty. Before the pumphouse was constructed Goulburn residents collected water in tanks or wells, or purchased water from a water carter. The board installed a 1893 120 HP Appleby Bros steam engine to drive the water pumps. The Appleby beam engine is a typical compound condensing steam engine based on an Arthur Woolf design and 1804 patent. The pumphouse and steam engine was operational in 1886. The engine was driven by two Lancashire/Gallaway boilers in the boiler house. It is known as a beam engine because of the large overhead rocking beam that transmits motion from the pistons to the cranks. Waterworks beam steam engines, according to Bruce Macdonald (manager, 1974), were not common in Australia with the Goulburn engine only one of ten in Australia, all in New South Wales. The others were located in Sydney, Newcastle, Wagga Wagga, Albury and Bathurst. The Goulburn steam engine, according to the Australian Institution of Engineers, is the only intact example in Australia. A northern annex to the pumphouse building was built in 1897 to house a secondary steam pump, with additions in the late 1920s. The southern annex was built in 1918 to house the first electric pumps which operated in tandem with the steam pumps until 1932. The complex was managed by Goulburn City Council from 1887 to 1922. The facility supplied water to the town until 1977 when the waterworks closed. The waterworks is a rare example in Australia of a complete steam powered municipal water supply left in its original location. The facility is of national scientific and technical significance. What is under your feet and totally ignored? What do you walk over everyday? What is essential in an emergency? What provides access to essential utilities? The answer lies under our feet. What is it? Give up yet? 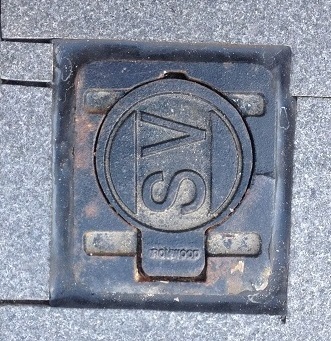 The answer is the humble utility inspection cover. Utilities like electricity, water, gas, sewerage, communications and others are essential in any community. Camden has acquired the utilities as time has progressed over the past 150 years to the present. Argyle Street has a number of utilities buried beneath the street and footpaths. Their histories provide a valuable insight into the town’s development and progress, particularly in the 20th century. The arrival of electricity, gas and water were part of Camden modernism and its influence on the town. Each of these utilities has transnational origins well beyond the township and illustrate the linkages between the town and wider world. For example the supply of clean drinking water in Camden was linked to an outbreak of scarlet fever in the later 19th century. Contagious diseases were a major health concern in the 19th century and were an ever present worry in daily life. Clean drinking water had an important influence on the development of public health. 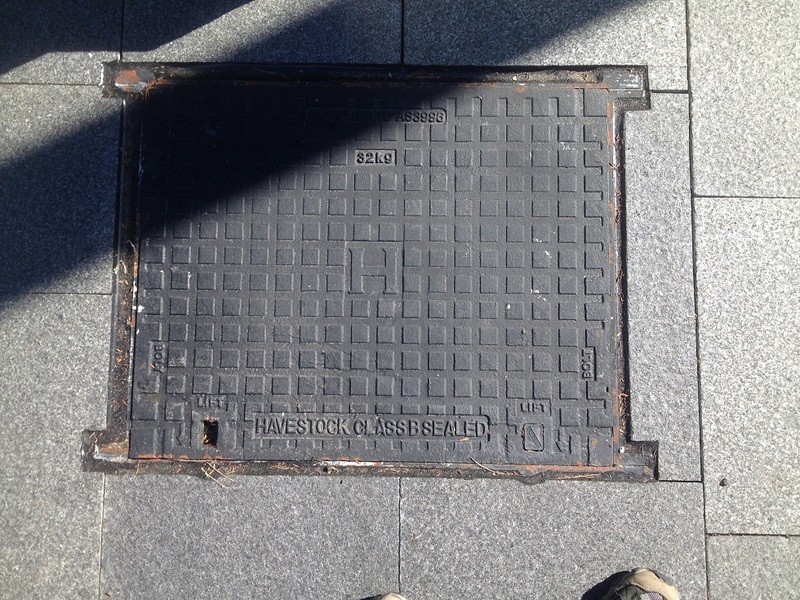 I was walking along Camden’s Argyle Street and it struck me that utility inspection covers are a historical statement in their own right. They are an entry point for the utility service as they also provide an entry to the stories that surround the delivery of the utility. Even the different logos for utilities illustrate the changes in the history of a telco or electricity supplier. 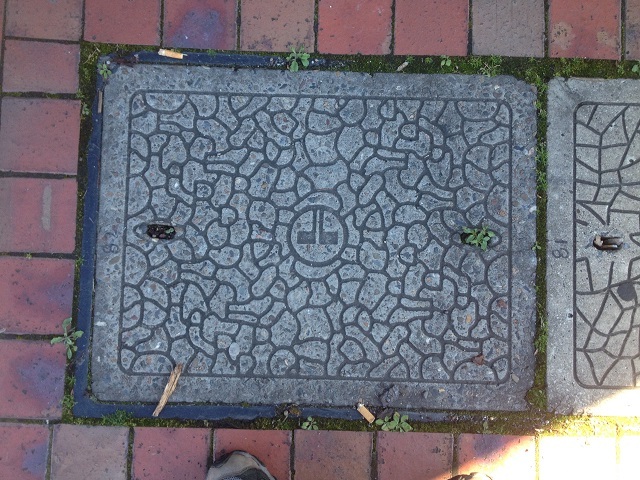 A cover might be a statement about a utility supplier that is now defunct. 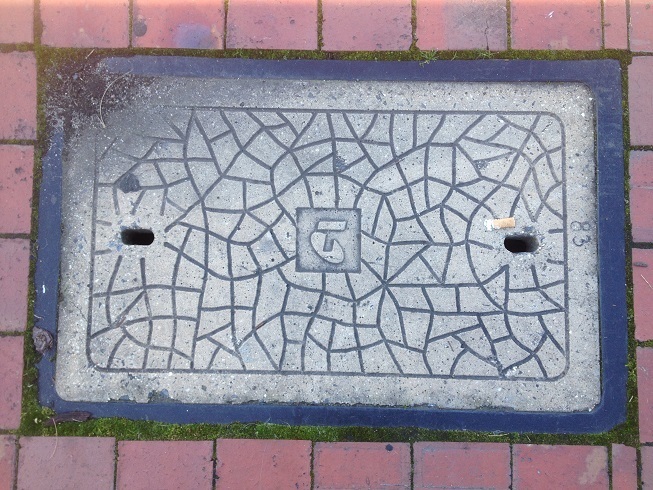 The utility cover are made of different material – cast iron, concrete, and others. These are all mysteries that are waiting to be solved for the curious mind. Or just for the bored and idle with nothing better to do. 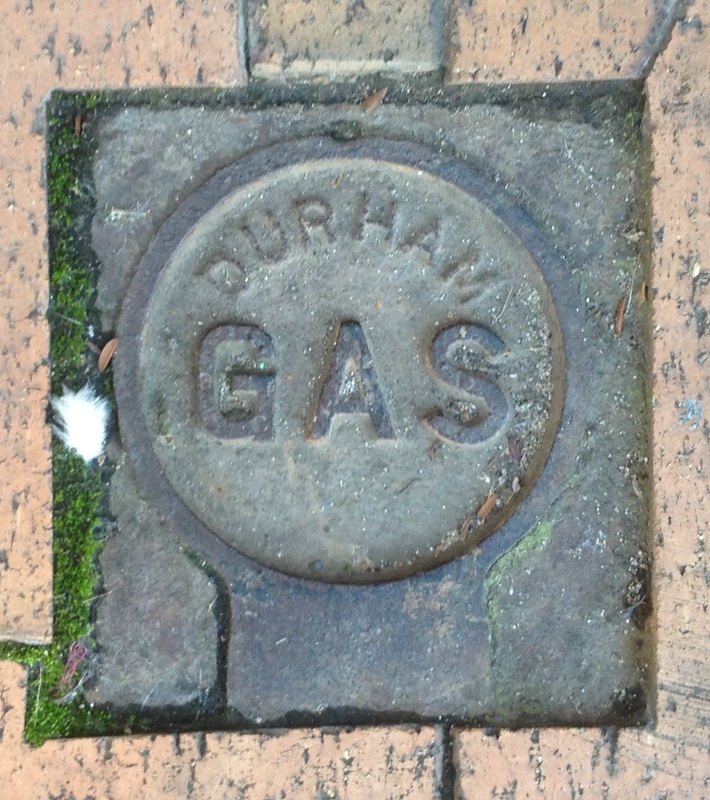 What about the Gas Cover from Durham above? 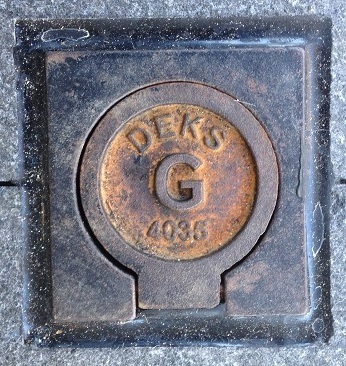 This is an inspection cover for the gas pipes using a Durham fitting probably around 1912. The Durham drainage fitting is a cast-iron, threaded fitting, used on drainage pipes; has a shoulder such as to present a smooth, continuous interior surface. (Free Dictionary) The Durham patent system of screw-joint iron house-drainage manufactured by the Durham House Drainage Co. of York USA (1887). 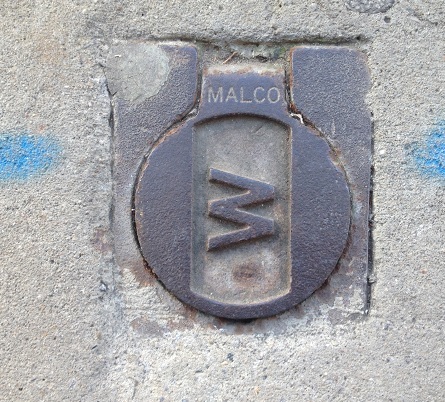 The Durham cover is for the Camden gas supply which was installed in 1912 by the Camden Gas Company.The gasworks was built in Mitchell Street and made gas from coal. There were a number of gas street lights in Argyle Street which were turned on in early 1912. The Camden News reported in January 1912 that many private homes and businesses had been connected to the gas supply network and were fitted for gas lighting. What is this cover for the NRCC. Does it still exist? The simple answer is no. The NRCC does not exist anymore. 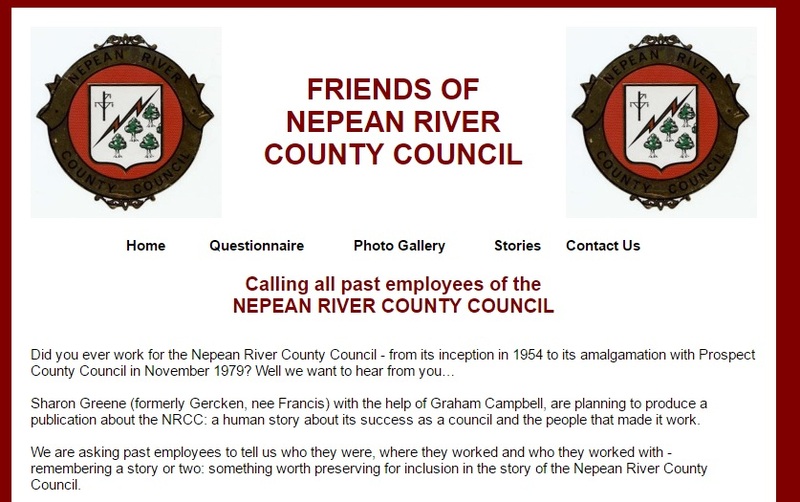 The NRCC was the Nepean River County Council. It was the electricity supplier for the Campbelltown, Camden and Picton area from 1954 to 1979 when it was amalgamated with Prospect County Council. This in turn became Integral Energy. Integral Energy was formed by the New South Wales Government in 1995 from the amalgamation of Illawarra Electricity and Prospect Electricity with over 807,000 customers. 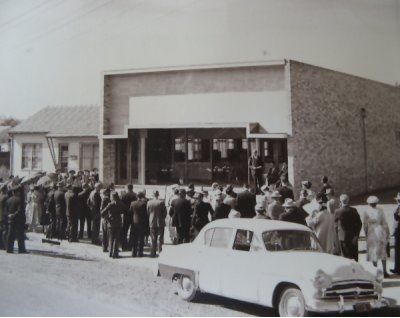 The Campbelltown office of the NRCC was located in Queen Street next to the Commonwealth Bank and in 1960 shifted to Cordeaux Street. By 1986 a new advisory office was opened in Lithgow Street. The council opened a new shop front at Glenquarie Shopping Centre at Macquarie Fields. There were shopfronts in Camden, Picton and other locations. In October 1954 the NRCC approved a design for its official seal. Alderman P Brown suggested a logo competition and a large number of entries were received for the £25 prize. 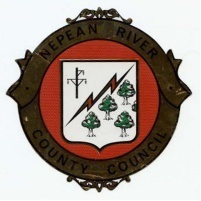 The winning design by artist Leone Rush of Lidcombe depicts electricity being extended to rural areas by a circular outline of the words ” Nepean River County Council”. Former office manager, Kay Kyle, said that things in the office in 1959 were pretty basic when she started in the office as a junior clerk. Working in the outdoor crews could be dangerous as Joe Hanger recalls. 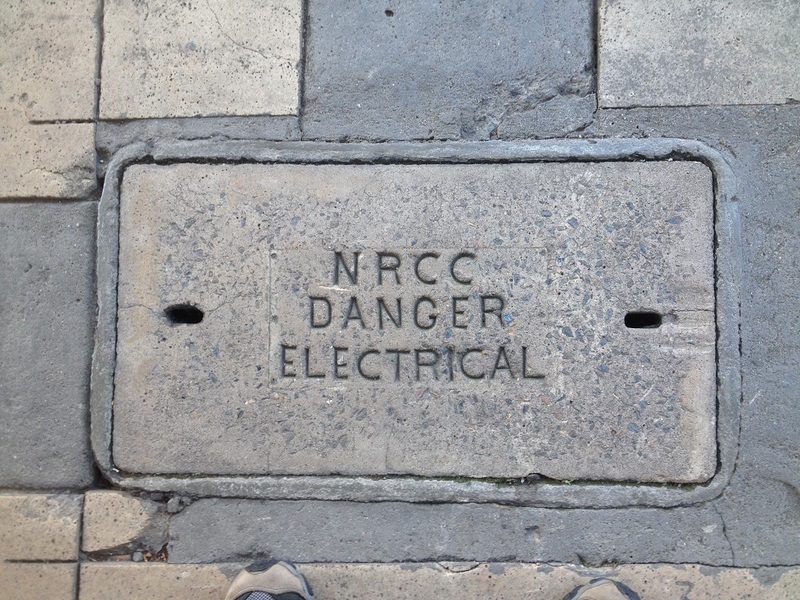 Past organisations like the Nepean River County Council have staunch supporters. If you are one of them join the Friends of NRCC. 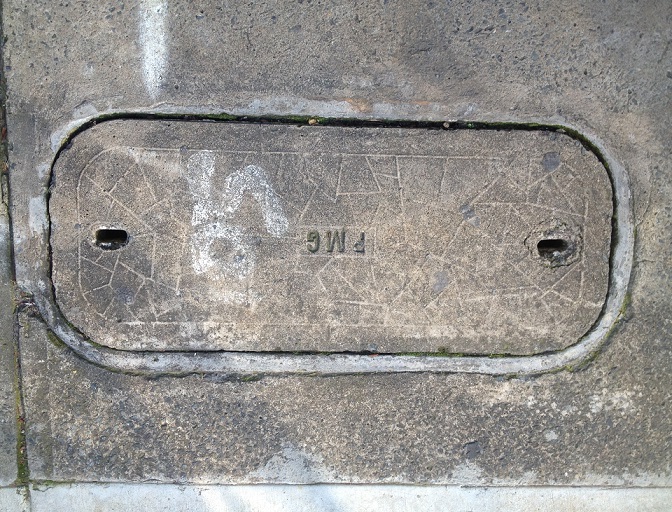 This inspection lid is for the telco which was the Postmaster-General Department of the Australian Government. The telco had a rich history related to communications in Australia starting in 1810 with the provision of the first postal service. In 1810 Governor Macquarie appointed Australia’s first postmaster Isaac Nicholls and the colonial government of New South Wales Government the first regular postal services including rates of postage. The new Sydney General Post Office was opened in George Street in 1874. The first telephone service was established in Melbourne in 1879. On Federation in 1901 the new Commonwealth Government took control of all colonial postal services. The Commonwealth Minister responsible for the Postmaster-General’s Department looked after telephone, telegraph and postal services across Australia. The Postmaster-General Department was responsible for international short wave services in the 1920s and the Australian Broadcast Commission in the 1930s. The Postmaster-General Department was broken up in 1975 with the postal service moving to Australia Postal Commission (trading at Australia Post), and telecommunications became the responsibility of Australian Telecommunications Commission trading at Telecom Australia. Telecom Australia was corporatised in 1989, renamed Telstra Australia in 1993, and partially privatised in 1999. In 1992 the Overseas Telecommunications Commission (est 1946) was merged with the Telecom Australia. The MWS&DB is the Metropolitan Water Sewerage and Drainage Board, today known as Sydney Water. 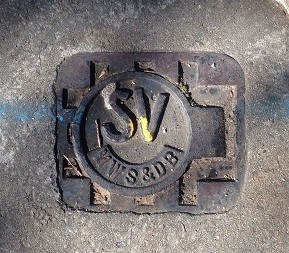 Originally the Board of Water Supply and Sewerage from 1888 to 1892. The MWS&BD operated under that name from 1925 to 1987, and before that it was known as Metropolitan Board of Water Supply and Sewerage between 1892 and 1925. After 1987 it was known as the Water Board (1987-1994), then it became Sydney Water Corp Ltd (1995-1999) with Ltd dropped in 1999. Once the army moved into Narellan Military Camp it commenced operation and became part of the wartime scene during WW2. Men were seen marching all over the district, there were mock raids and the men practiced firing small arms. The camp is an important part of the story of Narellan during war as thousands of men, and some women, moved through the camp on their way to somewhere in the theatre that was the Second World War. there is, I believe, a growing recognition of the fact that military training for the defence of Australia should be a normal part of our civic life, and that if it is to be just and democratic, it should be made compulsory. Militia units were created and equipped and some were deployed to sensitive areas. According to Milsearch in 1941 some units were deployed operationally to cover the likely Japanese landing beaches in the Newcastle – Sydney area. One unit established at the Camp at this time was the 2nd Australian Army Troops Company Royal Australian Engineers. This unit was almost solely involved in preparing route denial charges designed to frustrate enemy deployment inland following expected Japanese beach landings both north and south of Sydney. Narellan Camp also seems to have served as an assembly area at this time for units of the 8th and 9th Infantry Brigades. There were three ranges for training purposes that Milsearch has identified – a grenade range, a 600 yard range, and a 30 yard small arms range. The grenade range was located on a small hill adjacent to the old Oran Park Raceway and now covered with houses. The range was used for training hand grenade throwing and was constructed in late 1940. The 600 yard range has been variously described as Narellan Rifle Range, Cobbitty Range or the rifle range Cutt Hill Cobbitty. The range was located north-west of the camp and is described as ‘being three and a half miles west along Cobbitty Road from the junction with Bringelly Road, then north along dirt roads to the range’. There were fifteen targets at 600 yards for small arms training and the range was constructed in July 1942. There are indications, according to Milsearch, that there was another 30 yard range on the site in 1941. The 30 yard small arms range was located in a ‘disused quarry at the foot of water tanks on the right of the road from Camden to Narellan’. In 1942, according to Arthur Colman, the 2/1st Light Tank Squadron attacked RAAF Camden Aerodrome in a night exercise, and it is reported that they frightened the wits out of some of the RAAF personnel by charging over them in their slits trenches. As well, there was similar exercise in daylight (they had the only 2 light tanks in NSW). In the 10 weeks this unit was at Narellan they had instruction in small arms, map reading, truck driving and maintenance. As well there were the long route marches over all sorts of terrain to keep the men physically fit. For instance exercises by `Shanks pony’ and truck to such places as Wallacia, Mittagong, Nowra and the Kangaroo Valley area. Jim McIntosh reports that the Army had exercises over the whole of his property of Denbigh but they would always ask could they come onto the farm. He remembers that the tanks always `tore up a lot of grass’ but they were pretty careful not to disturb cultivated areas. In addition he recalls the Camp had trenches in the hills on the northern and north-western side of the camp adjacent to Denbigh. At Cobbitty Fred Small reported that the soldiers would frequently have marches through the village. A short march would be from the camp to Cobbitty Bridge over the Nepean River with groups of 40-50 troops. Larger groups of between 300-400 men would march through the village 2-3 times per day. The diary of Andrew Heyward of the 2/1 Independent Light Tank Regiment gives some of the character of activities at the camp. Oran Park Precinct: (Narellan Military Camp), Historical Review and Preliminary Investigations for Munitions Contamination, Milsearch/Growth Centres Commission UXO Study, 12 February 2007. Motoring, modernism and a new car showroom.